Welcome to the New Release post and Blog Hop showcasing projects from Our Daily Bread Designs February Release! You can see all of the February Releases here. Continue reading below to find out how you can win one of three $25 Gift Codes to the ODBD Website! 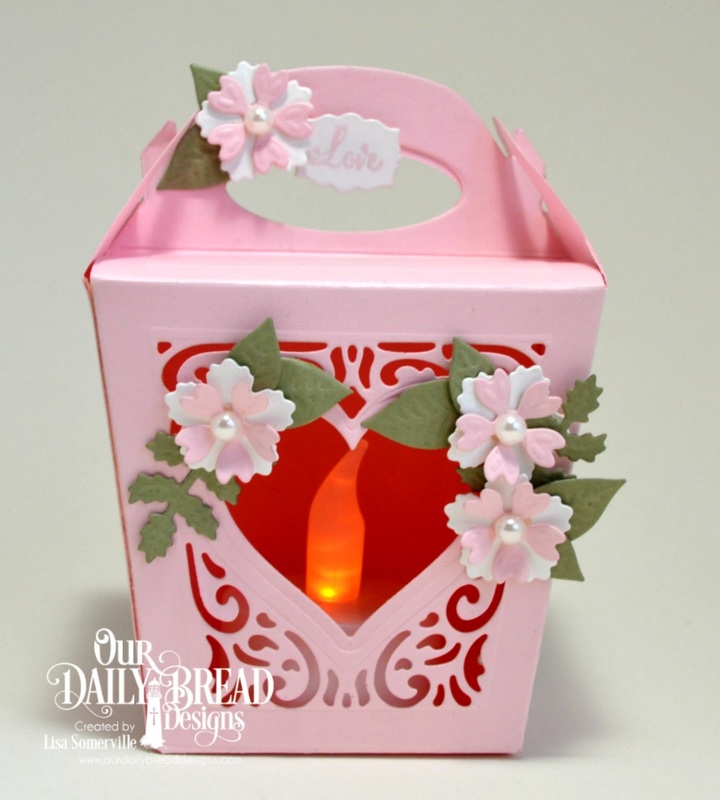 This month Our Daily Bread Designs is releasing another fabulous 3D die! The Glorious Gable Box die set is perfect for Wedding/Shower Favors, treat boxes and Children's Valentine Boxes! 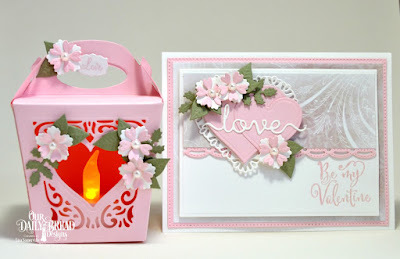 I posted a few Valentine Boxes using stamps/dies from our Sister Company, North Coast Creations. You can see those HERE on Instagram. Here's the gift set I created using products from the February Release, please see my complete supply list below. The first photo shows the Gable Box with the Flameless Tea Light Candle on, the second photo it is off. Here's photos of the individual projects along with the products used. Three randomly selected winners will each receive a $25 gift code to the ODBD Website just for commenting on the Design Team cards! You have until February 2, 2017 at 9:00 p.m. EST to leave your comments. The Winners will be posted February 3rd, on Our Daily Bread Designs Blog, so be sure to check back there to see if you won! What a great idea to put a tea light in your box! Wouldn't these make great party favors or hostess gifts? Or, a nice night light in your guest room. Beautiful, Lis! Lol...my first thoughts when I saw the die was to use a tea light, never got to the store to get one! Fabulous samples, beautiful design! These boxes look like they would be so much fun to make. Wow!! These are stunning!! Love the box! So pretty and elegant!! Your card is very beautiful! Love the delicate little flowers on your card. Such a sweet card. Your box is also beautiful. Wonderful projects. love, love, love that candle idea! great job! Great idea, making pink Valentine day cards. A real fresh approach from the standard red. Love your box also. Your gable box and card are so beautiful! 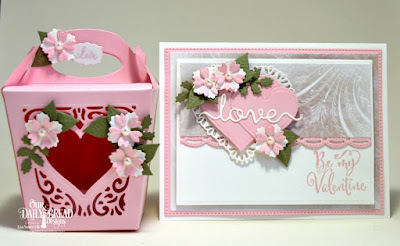 I love the flowers you used to embellish your gable box and card. Love the tealight, and your card is stunning! wow, this is just gorgeous and what a fantastic idea to make the box a little lantern!! Super special set! These are beautiful! Love the tealight in the box. 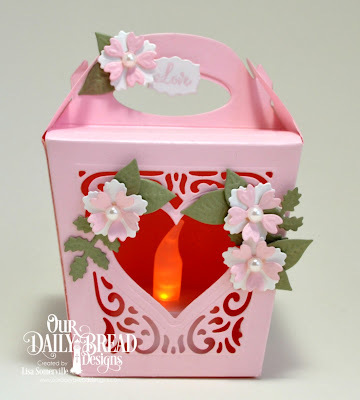 Love the beautiful little "lantern" you made using the gable box die. love the soft and beautiful colors for the gorgeous card, also. Such a delightful idea to open the side of the box and put a tea light inside. It will make a nice little gift. Beautiful set Lisa! I love the soft pinks and the dp you used, and what a great idea to make a luminary with the gable box! What a stunning set, Lisa!! I just love the candle peeking through the heart cut outs and all the soft pinks!! The combo of dp and details are perfect! Beautiful. Love the tea light idea. Beautiful projects Lisa, especially your card! These are such stunning creations. There are so many designs you can make with this set. This is the best release yet. How pretty! Love your fabulous projects! Just beautiful work. I could totally see this as a wedding card too! What a lovely, pink, matching set! beautiful card and box!! love the little flowers you used! also the colors and all the little details! Lovely, the light inside is so neat and I love how you did the border too on the card! How clever, Lisa! Love the tea light in the gable box! What a gorgeous gift set! Hugs! Lisa, this is such a beautiful set! Love the tea light in the gable box idea- so creative and fun! Thanks for inspiring all of us- hugs and I hope you have a blessed week, sweet friend!